Before we delve into the details of the new paper, it is important for our readers to understand that this study is not novel in finding harm. There is, in fact, an accumulating body of research on sucralose showing this chemical marketed as an artificial sweeteneris causing a wide range of adverse health effects. For instance, our sucralose research portal reveals 15 different signals of harm linked to this artificial sweetener, such as neurotoxicity. “Both food intake and body mass gain were significantly affected by the type of diet (for both p < 0.001). In total, the highest food intake was recorded in the SU [sucralose] group. The average daily intake of sucralose with the diet (14.2 ± 0.4 mg/kg body weight/day) did not exceed the acceptable daily intake (ADI, 15 mg/kg body weight/day). The food intake recorded during the meal before euthanasia did not differ between NS [not sweet], SC [sucrose], and SU [sucralose], and was 3.98 ± 0.5, 4.22 ± 0.41, and 4.71 ± 0.5, respectively. 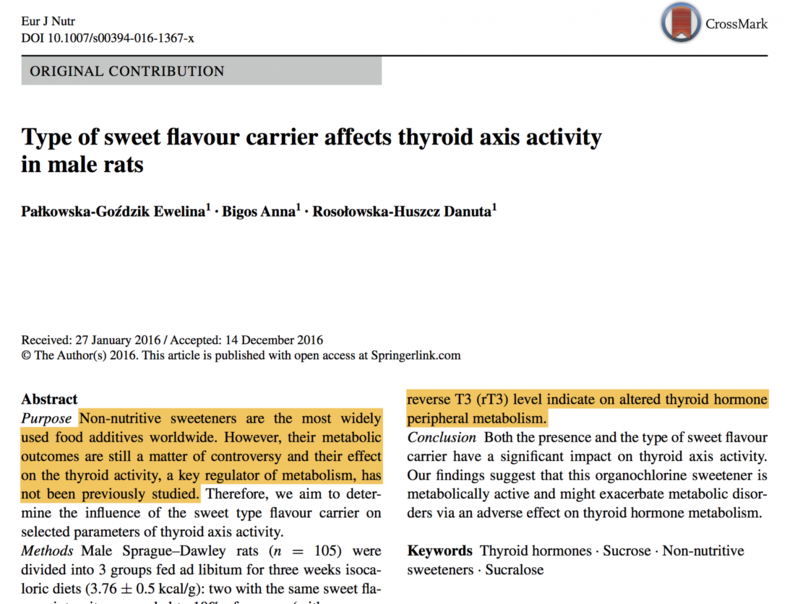 Because previous research has established that dietary carbohydrates directly affect thyroid axis activity, the study was designed to keep the carbohydrate content identical in order to isolate only the difference between the artificial and natural sweetener. 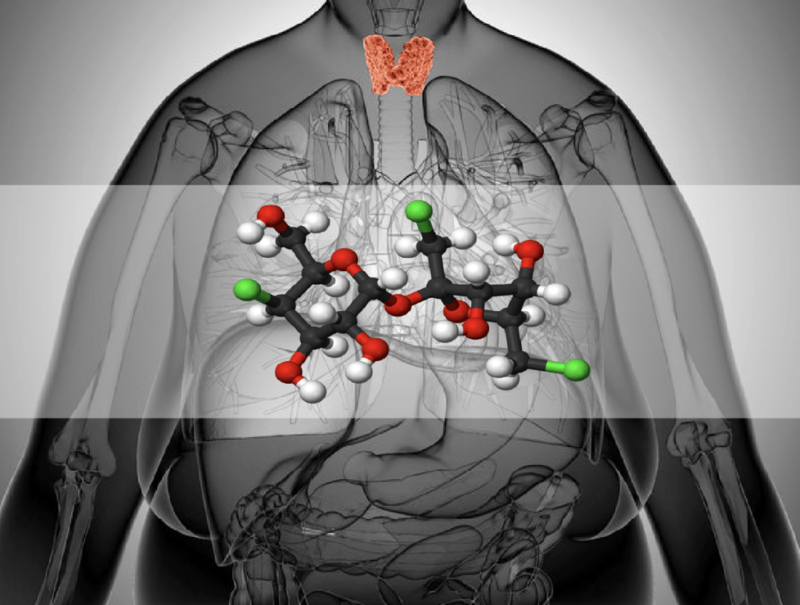 The results provide compelling evidence that the difference in thyroid and metabolic effects observed between the study groups were due entirely to sucralose’s significant and complex toxicological properties. So why are studies like this not regularly performed on humans to remove nagging doubt about their relevance? One reason is the prohibitive cost. Another, perhaps more significant hurdle, is that it is unethical to test chemical safety on human subjects. This obviously makes for great regulatory challenges in unequivocally proving human safety. So, how are the majority of chemicals released onto the market tested for safety? Animals. And so, the argument that animal studies are not sufficient to demonstrate plausible toxicity in humans is absurd, given that the toxicological risk assessments used to justify releasing chemicas like sucralose into the human food supply are invariably based on animal studies. In fact, these animal studies are used to determine an “acceptable level of harm” by extrapolating from them to find the dose that would not cause overt morbidity in a human. The notion, however, that the dose makes the poison, has been completely undermined, given research on petrochemicals, low-dose radiation, nanoparticles, and other non-linear dose responses observed following exposure to extremely low concentrations of toxicants, whose effects are amplifed because they mimic hormones (endocrine disruptors) or cause DNA damage and subsequent cellular transformation into cancer instead of inducing cell death (apoptosis). The most recent classical example of this is the finding that glyphosate, the main in the herbicide Roundup, exhibits estrogenic/carcinogenic/endocrine disruptive properties in the parts-per-trillion range. The researchers conjecture that sucralose’s adverse effects on the thyorid axis would be reflected in “thyroid hisopathology,” i.e. thyroid lesions/tumnors. Could this be one of the causes behind the mysterious global uptick in thyroid cancer diagnoses? This study leaves far more questions than answers. First, why are regulators turning a blind eye to the accumulating body of research indicating that sucralose is a highly toxic chemical whose safety has not be established? Second, why would anyone risk exposing themselves to a chemical when the evidence indicates that artificial sweeteners of all kinds promote weight gain, and increase appetitde — the last two things those who wish to lose weight, or “cut down on sugar” want? Thankfully we live in an age where research like this is now directly available online, the moment it is published. With greater access to information, we can all better exercise informed consent and take control of our health. We are also to better assess the health benefits of natural substances that render the use of synthetic ones unnecessary, such as honey, stevia, and xylitol. Use the GreenMedInfo.com Research Dashboard to learn more about these alternatives.